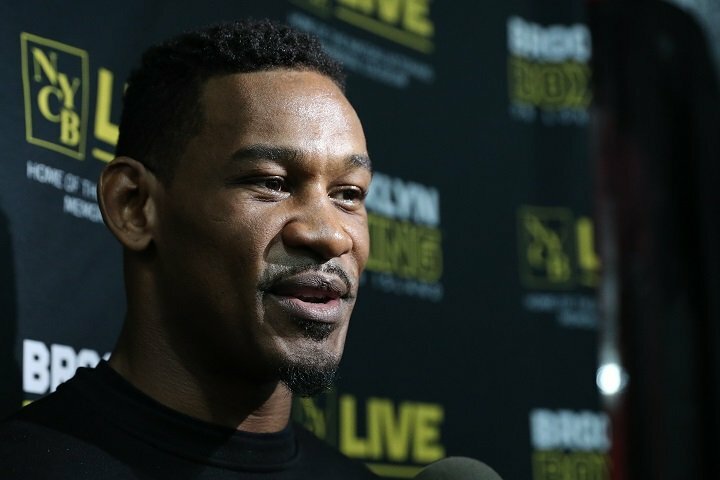 In the main event on Saturday, Nov. 11, Daniel “Miracle Man” Jacobs battle undefeated Luis Arias in a twelve-round middleweight bout at NYCB LIVE, home of the Nassau Veterans Memorial Coliseum and televised live on HBO World Championship Boxing beginning at 10:00 p.m. ET/PT. Opening the action-packed HBO telecast will be super lightweight knockout artists Long Island’s own Cletus Seldin and Roberto Ortiz squaring off in a 10-round bout. In the chief-support bout, exciting heavyweight Jarrell Miller looks to stake his claim on a heavyweight title shot and in his way is Polish giant Mariusz Wach. As part of the stacked undercard, undefeated New York City police officer Dimash “Lightning” Niyazov (12-0, 5 KOs) will fight in a six-round lightweight bout. “There are 250 cops in my precinct and about half of them will show up. This guy (points to friend) is a cop in another precinct and he loves boxing and he will come and he will bring a bunch more. Every time I fight in New York he brings his cop friends and I bring my cop friends. Between Long Island and New York City there are 35,000 of us. Each of the other precincts will have about 20 guys there. It’s great support. We are a big family. It is a dream of mine to walk to the ring with hundreds of cops and just me walking down the middle. Previous boxing news: Who is “the guy”?